Marcella Harte and Nancy Sakaduski read their book to children during an event at the Hockessin Book Shelf. Nancy Sakaduski met Marcella Harte three years ago at the Hockessin Art and Book Fair. Marcella, an illustrator, had a mini-portfolio with her that day, and Nancy was impressed by the work. “I wasn't actively looking for an illustrator to work on a book with me,” Nancy recalled during an interview at the Hockessin Book Shelf in early November. But she later saw one particular drawing by Marcella that captured her attention. Over the course of a few months, Nancy and Marcella had some conversations—and some ideas for a children's book, centered on a mermaid, started to take shape. Marcella and Nancy would spend two years working on “The Mermaid in Rehoboth Bay,” a new children’s picture book that was published by Delaware-based Cat & Mouse Press in August. 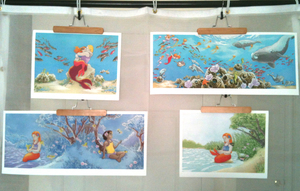 The illustrations in “The Mermaid in Rehoboth Bay” are the work of Marcella Harte. Her highly detailed illustrations depict two parallel story lines throughout the book. Nancy, an award-winning writer who founded the regional publishing company Cat & Mouse Press in 2012, said that she and Marcella collaborated well together immediately. They agreed from the very start that they wanted a mermaid that young readers could identify with. They also wanted the characters in the book to look like real children—they didn’t want them to be overly mature or idealized. As Nancy explained, they wanted any type of child who would read the book to be able to see themselves in the characters. Marcella and Nancy also knew that they wanted to create a book that children and their parents would enjoy together and read again and again. So far, the 32-page hardcover book with a dust jacket has been earning rave reviews from parents and librarians. With its enchanting illustrations and captivating story, children love the book, too. On Nov. 6, Marcella and Nancy held a book-signing and talk at the Hockessin Book Shelf. They offered insights into the story and the illustrations as they read from the book. Nancy explained that mermaids have fascinated children and adults for hundreds of years, and “The Mermaid in Rehoboth Bay” captures that allure while providing a child-pleasing story of friendship, respect for differences, and overcoming obstacles. Marcella’s highly detailed illustrations depict two parallel story lines—one that follows a girl who lives near the sea but is afraid of the water, and one that follows a child-like mermaid who finds herself far from home. The two girls discover each other, become friends, and find a way to solve their problems together. Nancy expressed admiration for Marcella’s ability to capture their vision for the characters. Marcella went so far as to hire a child model from the Delaware branch of the Barbizon Modeling & Talent Agency so that her illustrations could depict natural poses and childlike body characteristics. “She was just a pleasure to work with,” Marcella said of the model. The book includes several spreads where there are no words—the illustrations themselves move the story along. “These are individual watercolor paintings, not computer-generated illustrations,” explained Nancy. “You can see how the illustrations just pop—every page is an individual painting. Every page is a work of art.” According to Nancy, the first thing many people notice is the quality of the illustrations in the book. The meticulously detailed scenes draw readers in and tell their own story. In fact, there are several spreads with no words at all to distract from the spectacular illustrations, which include a night scene with glowing fireflies and luna moths, and a dream of an undersea world that includes jellyfish, dolphins, and whales. Nancy pointed out that Marcella’s illustrations don’t just reflect what her words are saying in the book—instead, the illustrations and words both move the story along. The book includes environmental themes, and highlights the beauty of nature. Marcella did the research on animals that can be found off the coast of Delaware. Each of the two main characters has a companion animal (a seagull and a sea turtle) that follows her through the story. Each character also wears a necklace of found items, and they add to their necklaces as the book progresses. Nibi is collecting things that are unusual to her, such as man-made debris found in the ocean and Terra is collecting things that are unusual to her, such as items from the ocean that are found on shore. Nancy explained that the Cat & Mouse Press was established with the goal of producing books that are fun, entertaining, and of particular interest to residents and visitors to the Delmarva region. “The Mermaid in Rehoboth Bay” certainly fits in very well with the company’s goals. Nancy has published 22 books and more than 100 articles. One of her recent books is “How to Write Winning Short Stories,” which is based on her experiences running the Rehoboth Beach Reads Short Story Contest and working with dozens of writers to perfect their short stories. Marcella has been fascinated with art and illustration since childhood. Her publishing credits include the anthology “The Stories in Between” by Fantasist Press, a collection of science fiction and fantasy stories published in 2009. The themes that run deepest in her work include fantasy and science fiction, with special affinity for old folk tales and the supernatural. Marcella and Nancy said that they really enjoyed collaborating on the book, and they are pleased with how it turned out. “It was a real pleasure to work on this together,” Marcella said. They were very committed to maintaining a high level of quality on every facet of the book, so it was a project that demanded both a lot of time and energy. They might work together in the future, but this project was so exhausting that they aren’t ready to start a new one right now. “The Mermaid in Rehoboth Bay” is available only through stores and the Cat and Mouse Press website. The book retails for $19.95. The book is available on the Cat and Mouse Press website and in independent bookstores in the area—including the Hockessin Book Shelf in Hockessin, The Growing Tree Toy Shop in Kennett Square, and Oranges & Lemons in Greenville. Cat and Mouse Press publishes a free weekly newspaper for writers, Writing is a Shore Thing. For more information, visit Marcella’s website at www.marcellaharte.com or the Cat and Mouse Press website at www.catandmousepress.com or its Facebook page, www facebook.com/catandmousepress.